In part 2, I described the end user / secretary experience. In this part I wanted to go through more of an advanced scenario. One of the problems with Lync delegate ringing is that when a call comes into the boss, all their delegates will simultaneously ring. For some customers and secretaries, this is a problem because bosses may have a direct secretary that should answer their calls, but equally the secretary has a hierarchy of other bosses secretaries who can answer the call in their absence. For instance, boss 1 mandates that secretary 1 should answer their call as a top priority. Other bosses secretaries should not be disturbed at this point. If secretary 1 does not answer the call due to either being away, or busy on another call, then boss 2’s secretary should answer the call and so on. How do we create this scenario? First, we need to add the secretaries to the Anywhere 365 UCC as agents. At this point we need to decide when the caller attempts to call the boss, what should happen if no secretaries are available to answer the call on their behalf? In part 1 we decided that unanswered calls should be forwarded to the boss’s voicemail. Therefore, in this scenario we will assume the same. Although this may sound like a challenge, the setup is remarkably simple. I will use an availability skill in order to configure this. Note: We created a forward skill in part 1 to forward to the boss’s voicemail. In this example I have assumed that this has already been created. Choosing the availability of available means that only secretaries with an available presence will be hunted. The escape skill is the forward skill to the boss’s voicemail service. If the boss wanted their secretary to be hunted when they had a busy presence, then the UCC lowest hunt presence must be set to busy. One note on this, if this is changed, it is a global setting, so every scenario configured under the same UCC will be affected. Therefore, it is a decision point as to whether a dedicated UCC is required for this. Next we need to assign this skill to the secretaries in the hierarchy. From the Agent Skills list, select the skill “Boss 1 Secretary Hierarchy” and the first secretary to be hunted e.g. secretary 1. Then assign a skill value of 100. Repeat the process for secretary 2. However, this time assign a skill score of 90. Repeat for secretary 3 and assign a skill score of 80. The last piece is to change the skill of the endpoint for the boss’s calls to the skill and you are ready to test. Occassionally secretaries may want to call out on behalf of the boss using the boss’s caller ID. Personally I am not convinced that this is a hard requirement for any scenario to be honest. The ability to impersonate your boss is just misleading and most people nowadays have become acustomed to secretaries calling out as themselves. As of today, Anywhere 365 supports outbound dialling from the main endpoint address only. 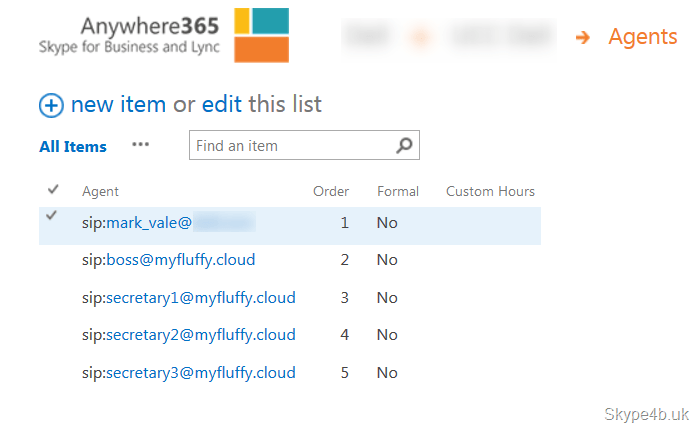 If you wanted to give the secretary the ability to call on behalf of the boss now, you would still need to configure Lync / Skype for Business delegates on the boss’s client settings. This is especially true if one UCC was performing routing for several different bosses. However, like I said, I do not see this as a showstopper for any boss / secretary scenario. Taking it one step further – What about having a secretary who uses Skype Consumer? Say what?? 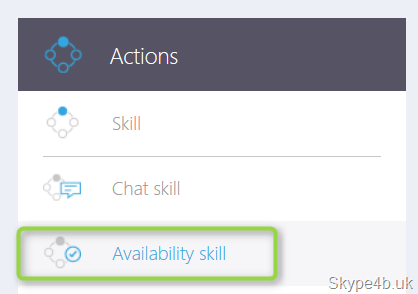 What if you had a requirement that meant a secretary needed to be contacted using their Skype Consumer user account? 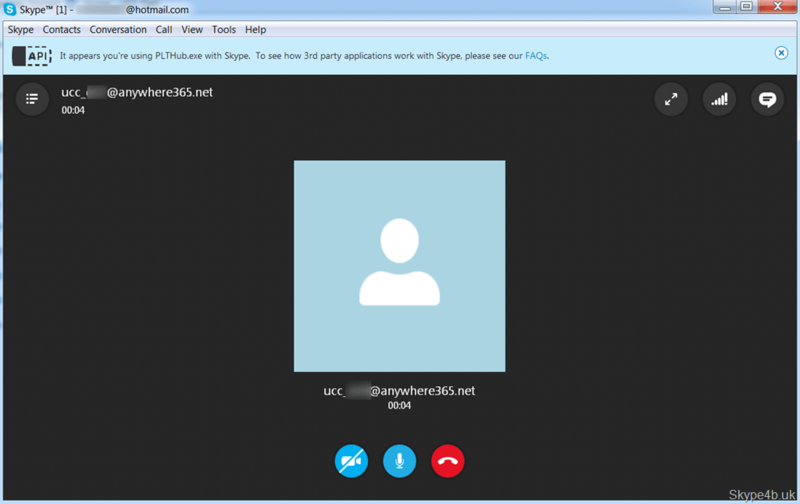 Provided you have Skype for Business server (or even Skype for Business Online) with Skype consumer integration, you can have an agent in your UCC that is a Skype consumer endpoint. How about that? Cool eh?